At EyeCare Associates, as part of our patient-first philosophy, we are always committed to investing in new technologies to better serve you. This is one of the many ways that sets EyeCare Associates apart from other eye care providers. As such, because of our commitment to providing our patients with the latest innovations in patient care, we now offer the optomap® as an important part of our eye exams. 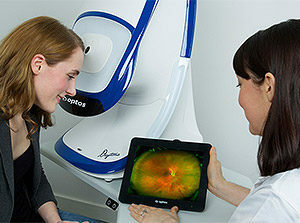 The optomap produces an image that is unique and provides EyeCare Associates doctors with a high-resolution 200° image helping to ascertain the health of your retina. This view is much wider than a traditional 45° image. Many eye problems can develop without symptoms, in fact, you may not even notice any change in your sight – fortunately, diseases or damage such as macular degeneration, glaucoma, retinal tears or detachments, and other health problems such as diabetes and high blood pressure can be seen with a thorough exam of the retina. The optomap is fast, easy, and comfortable for anyone. The entire imaging process consists of you looking into the device one eye at a time. The optomap images are shown immediately on a computer screen to review. *Not available in all locations. Please check with your office before scheduling an appointment. 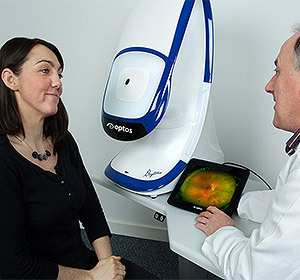 For more information on the optomap please visit the optomap website. Watch this quick video and learn exactly how much more you can see with optomap versus other retinal imaging devices!